The Daily Digress: My pocketbook. 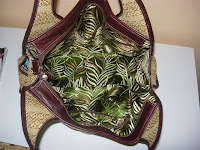 Because this sort of thing is endlessly fascinating to some people, including me, I've decided to post pictures of my purse and what's in it, for your viewing pleasure. I really love it. I got it at Hayden-Harnett . Just so you know, I like all of their bags, so feel free to buy me one, no need to wait for a special occasion. These were in the left, front pocket. As you will learn, I have an obsession with lip products. 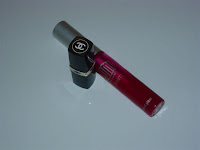 One of these is a free sample from Chanel that I may buy when it runs out. The other is a lip plumping product that tastes like cherry. 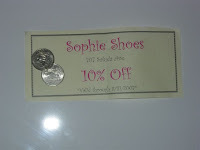 These were in the other front pocket, a coupon for ten percent off at a new shoe store in town and two quarters. I probably won't use the coupon, which expires in three days, but I won't throw it away. In the side pocket, we find gum. I chew it constantly, which is why I need all the lip products, because I chew them off. 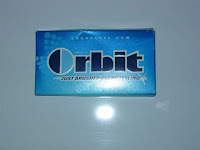 I like Orbit, but I keep meaning to chew gum with Xylitol, to prevent cavities. I'm pretty old, though, and I don't have any cavities, so it's probably not going to happen now. The other outside pocket just had some garbage. I didn't take a picture of that, but I threw it away. I usually keep my keys there, but I can't find them. At least now I know for sure that they aren't in my bag. What you see: 3 (different!) Kiehl's Lip Balms, 2 M.A.C. lipsticks, 1 Clinique lipstick, 1 M.A.C. lip pencil, 1 Clinique double sided lip gloss (Freebie! Yes! 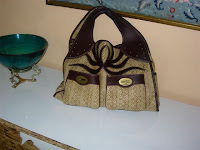 ), 1 M.A.C. pressed powder, 1 hair rubber band, 1 Band-Aid, 1 free sample of Kiehl's Baby Lotion, 1 free sample of Aveda lotion and 1 makeup mirror. 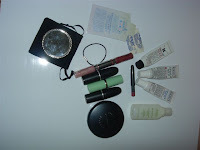 In case you're counting, we're at ten for total lip products in my bag, eleven if you count the double gloss as two. When my Nana died, we were all at the house getting ready to go to church. As I'm sure she would have wanted it, we all went to apply lipstick before we left. 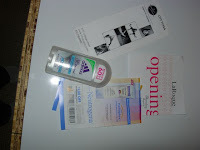 I was the only one who had it available and I had seventeen products in my (much smaller) bag. Something for everyone. 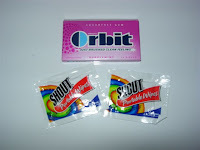 Another pack of Orbit, the frivolous Bubble Mint, and two Shout! stain remover wipes. 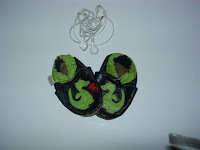 Middle pocket, baby shoes that no longer fit and iPod ear phones. 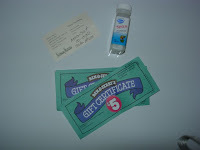 Last pocket, Homeopathic sinus tabs for babies, two five dollar Ben and Jerry's certificates that belong to the X-Man and a business card from a sales lady at Neiman Marcus who let me try on a Cartier Tank Française that I want and shouldn't get. Now for the murky depths. First we have my blood pressure medication, some Chinese Nasal Tabs from my acupuncturist (I take a few in smoky bars when my nose starts to get stopped up. 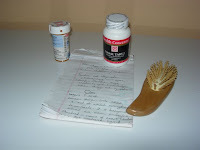 They totally work), a tiny hairbrush and a notepad with notes from the Yoga philosophy class I'm taking. I don't really understand the notes, but I think it's good for my Chi or something to carry them around. Moving on. 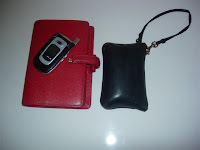 Here we have one red FiloFax, my wallet (which may have one more lip product, but I'm embarrassed to check) and my cell phone. I like to keep the phone at the bottom, so I can never find it when it rings. I think that gives me an air of mystery. The next item is totally embarrassing and proof that I have no morals. 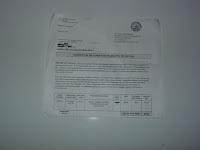 It's a letter from the fine city of Alexandria, Virginia, informing me of the parking fine I incurred while visiting there last month. I didn't pay it because I thought maybe they wouldn't find me. I'm ashamed and embarrassed and I'm going to pay it now, with the twenty five dollar penalty. 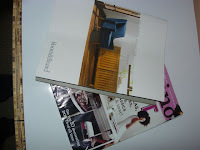 Here we have the Room&Board Catalog and a back issue of Domino Magazine. Incidentally, I meant to pick up a different back issue that had an article on couches. I'm thinking about a new couch and I read these in the carpool line. 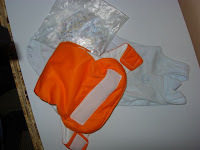 Last, but not least, because I refuse to carry a diaper bag (would you want Winnie the Pooh on your purse? Me either), we have one cloth diaper (an All-In-One for convenience while we're out), a plastic bag of wet washcloths and a Petit Bateau sleeveless onesie for emergencies. I love the onesie because Baby J's fat wittle arms look so cute in it. It looks fab with his tiny army pants. And this, my friends, is the inside of the empty bag, right before I reloaded. Was that good for you? I found it incredibly healing. I totally enjoyed every moment of that. I think it's time for me to move up in the world. I felt guilty for never being able to find my phone when it rings, now I think I will just make it a way of life, as you have. Thank you so much. You've changed me. How did you fit all of that into that bag? I enjoyed that so much I will probably steal it for my blog. I like your purse. It looks like a face. Like a high priestess of something glamorous. Oh, and since you have no idea who I am, I linked over here from Jody's blog.